Honeybees are an essential part of farming and the wider ecosystem. Since the middle of the 1990s bee populations around the world have suffered dramatic decline through diseases, intoxication, and unknown causes. Veterinarians have had little training in bee health but as the situation continues, qualified animal health professionals and, in particular, veterinarians are being required to become involved as new dangers threaten honeybee health everywhere because of global apiculture, trade and exchanges of honeybees, products of the hive and beekeeping material such as Aethina tumida (the small hive beetle - a beekeeping pest) introduced in Italy in 2014 or the mite Tropilaelaps spp (parasitic mites of honeybees). This book will provide an overview of bee biology, the bee in the wider environment, intoxication, bee diseases, bee parasites (with a large part dedicated to the mite Varroa destructor) pests enemies, and veterinary treatment and actions relating to honeybee health. The book will also cover current topics such as climate change, crop pollination, use of phytosanitary products, antibiotic resistance, and Colony Collapse Disorder. 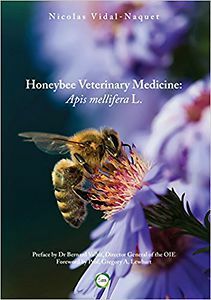 While aimed at veterinary practitioners, students and veterinarians involved in apiculture and bee health (officials, researchers, laboratory veterinarians, biologists...), the book can also be beneficial to beekeepers, beekeeping stakeholders, animal health and environmental organisations.